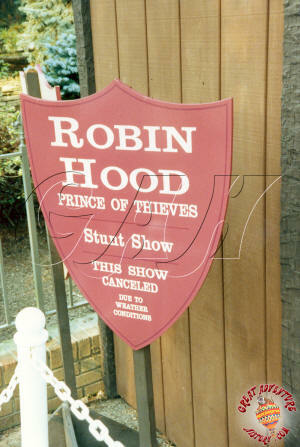 With the success of stunt shows in the Universal Studios parks, stunt shows became a mini trend in the theme park industry in the early 1990's. Looking to promote their brands, Warner Brothers looked to the Six Flags theme parks to try their hand at stunt shows of their own. With Time Warner taking a growing interest in Six Flags and eventually buying the chain outright, they looked to promote more of their brands and products in the theme parks besides the Looney Tunes. 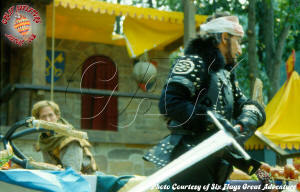 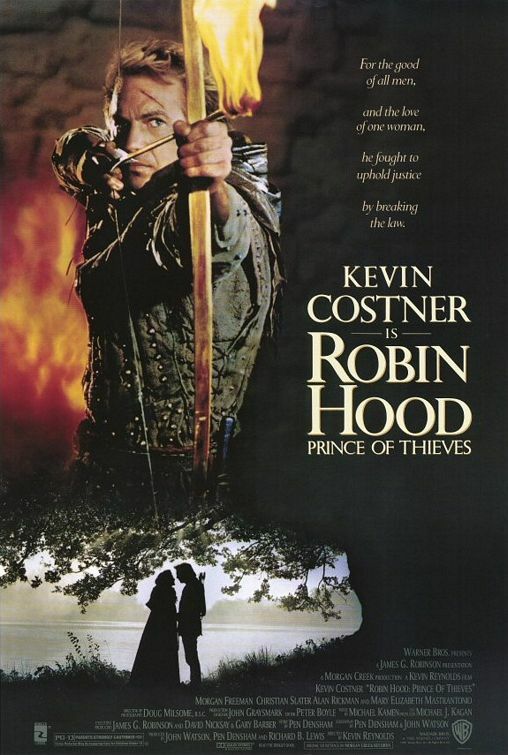 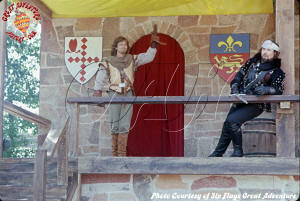 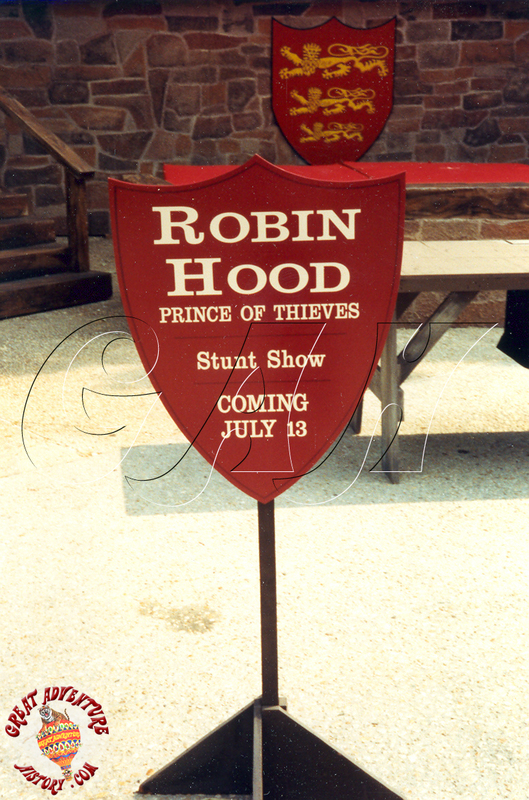 One of the first of these cross promotions was a Robin Hood Prince of Thieves stunt show based on the hit Kevin Costner film. 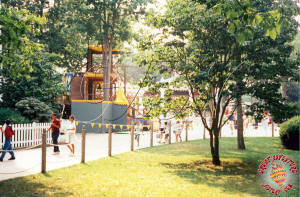 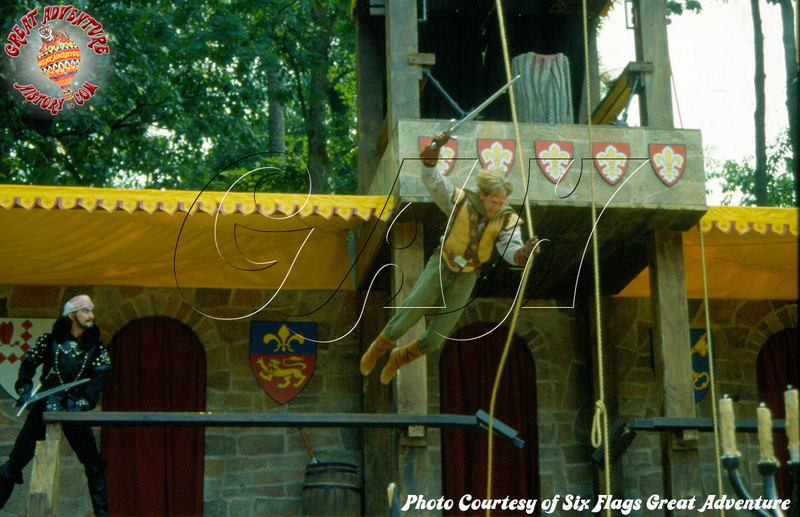 Though the film was poorly reviewed, it was a huge hit in the summer of 1991, and Great Adventure became home to the first stunt show based on a film in any of the Six Flags parks. 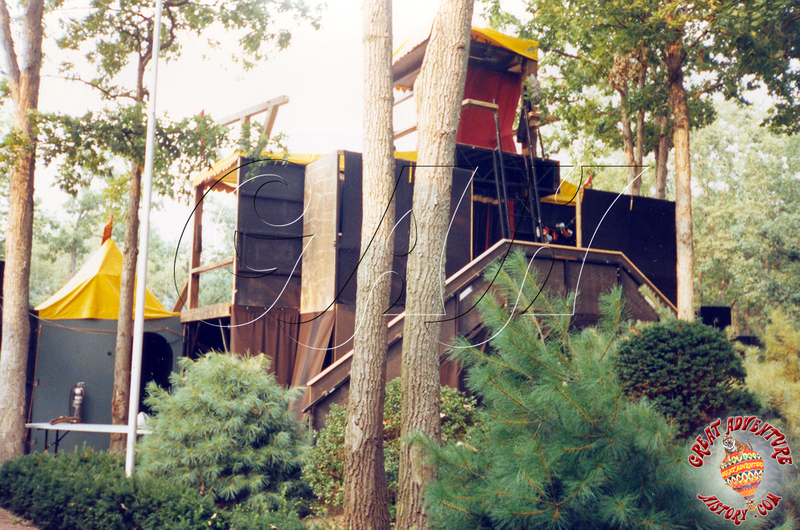 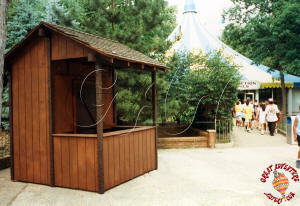 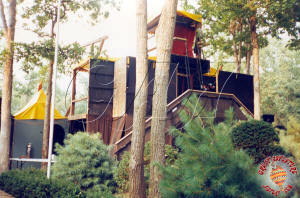 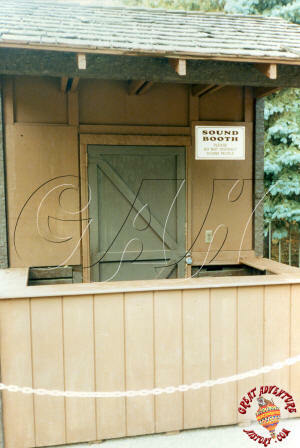 In one of the many examples of buildings being moved and repurposed in the park's history, the former photo booth from the Log Flume was used as a sound booth for the show. 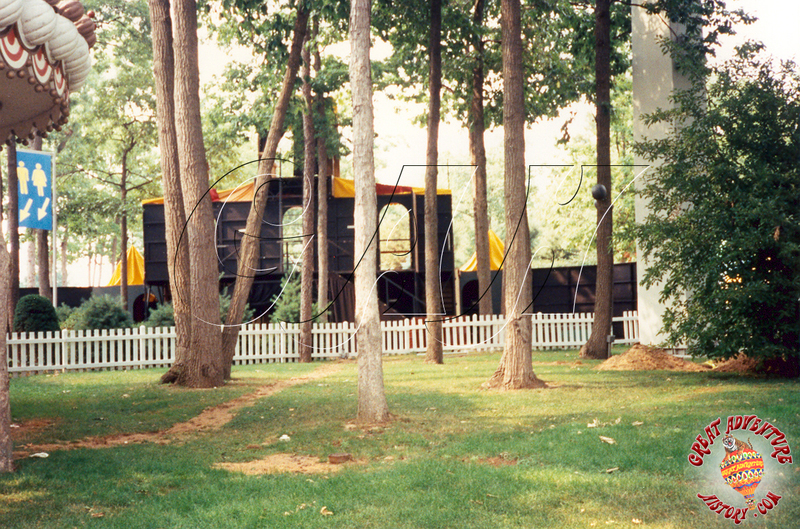 Six Flags Great Adventure capitalized on the film's success building a simple stage area on the vacant patch beside the Yum Yum Palace that had been home to the Monster Spin which had been removed several years prior due to mechanical problems. 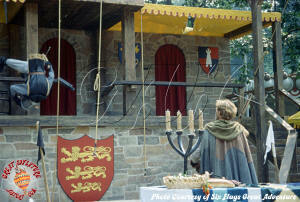 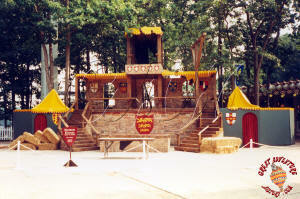 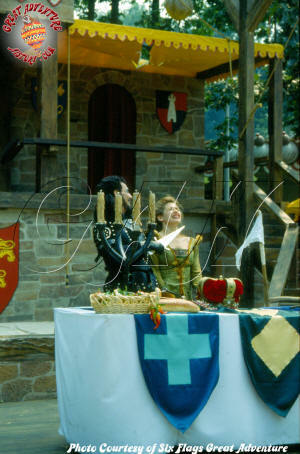 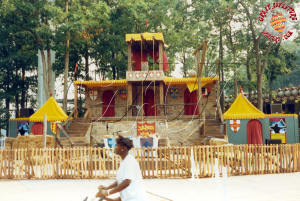 The stage set was a multi-level series of platforms which resembled something out of a renaissance fair. 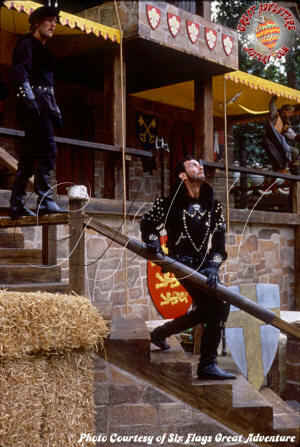 It was simple but effective, offering multiple levels for action to take place with stairs and doors for the performers to enter and exit as they fought. The show began performances on July 13, 1991, one month after the movie premiered. 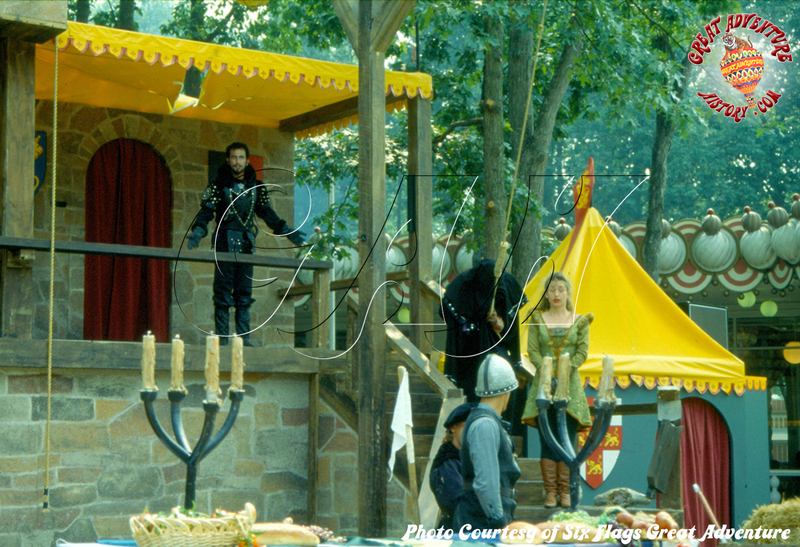 The Robin Hood Prince of Thieves Stunt Show was well attended in part to its prime location on Dream Street in the center of the park. 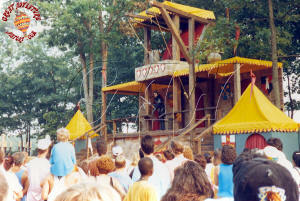 Seating for the show was provided by rows of hay bales which needed to be replaced periodically due to guests picking apart the hay as well as damage caused by rains. 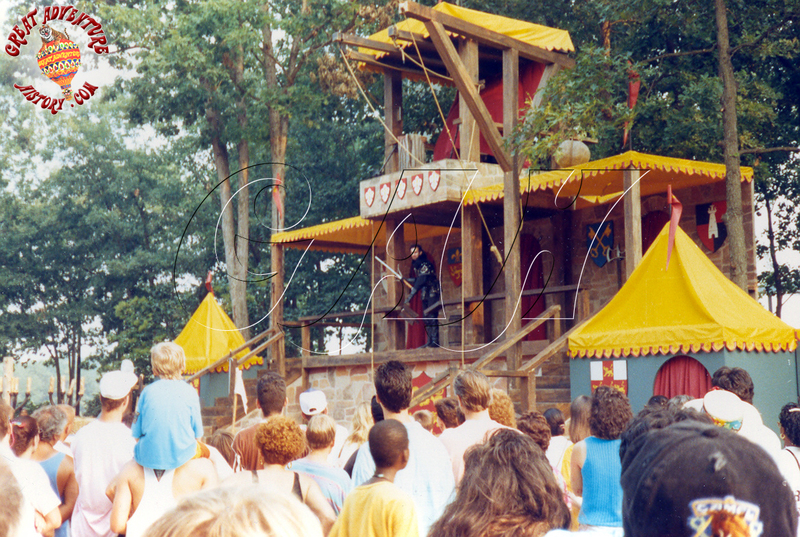 The show often played to standing room only audiences which lined the back and sides of the seating area. 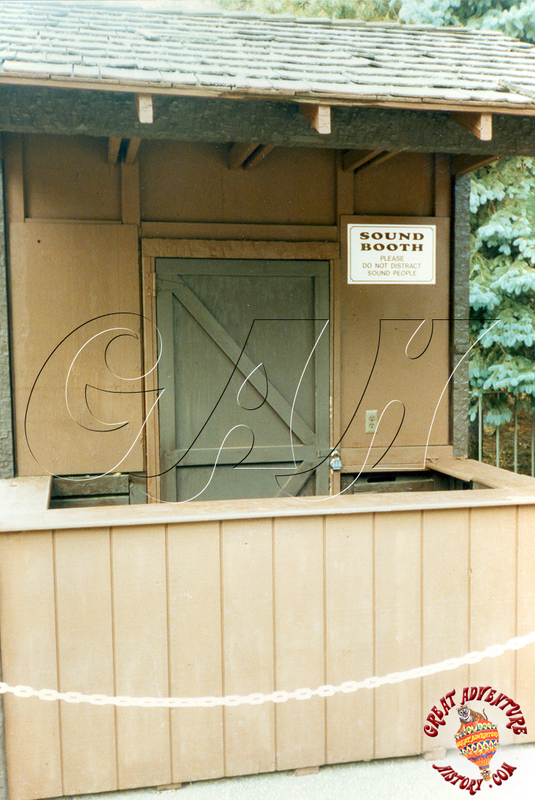 The inviting musical soundtrack which was played extra loud so that it could be heard over the recently installed neighboring ShockWave coaster also beckoned guests. 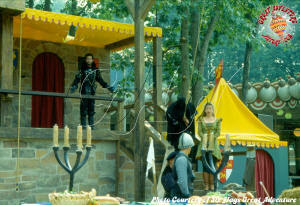 Given the constraints of a small performance area the stunts were relatively limited. Most of the action made use of the multilevel stage with vertical stunts using ropes, swings, and jumps from the upper perches. 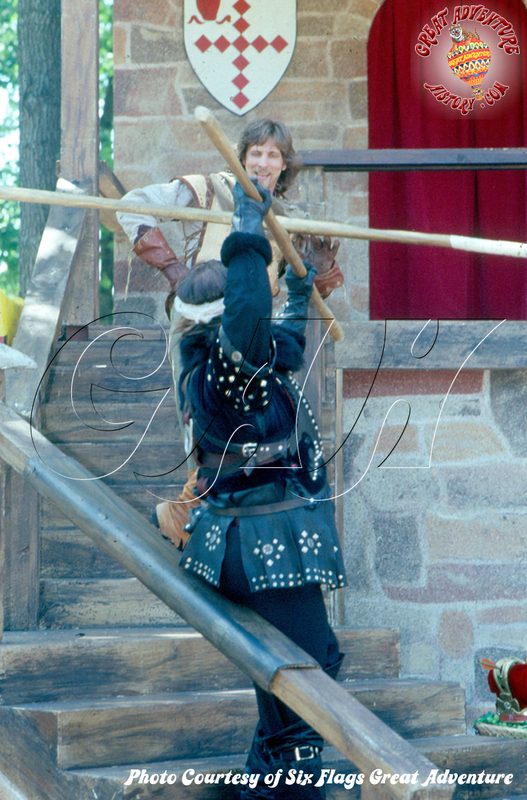 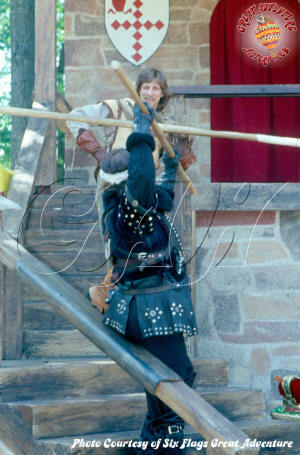 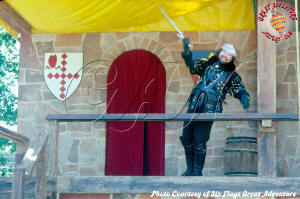 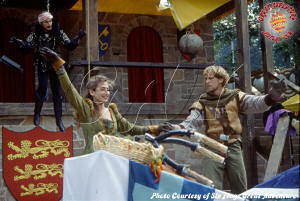 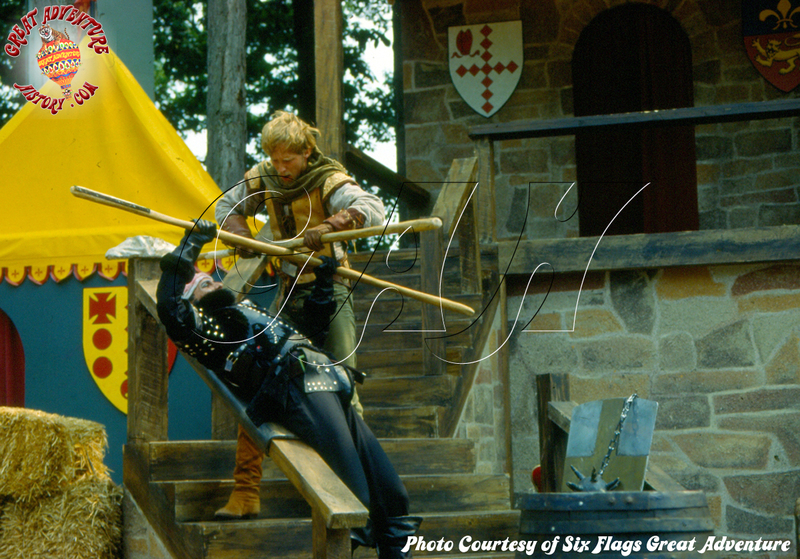 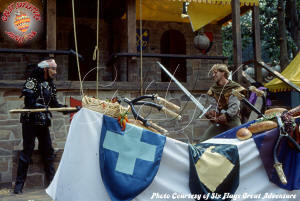 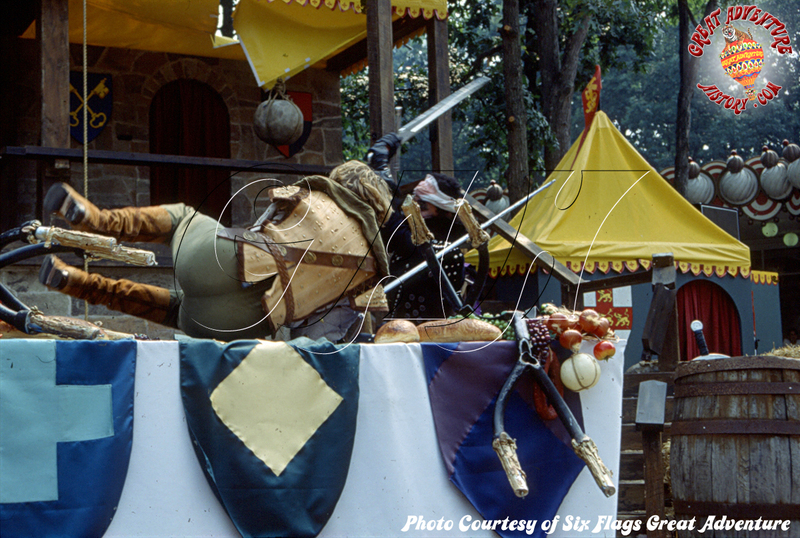 Ground level stunts included trick arrows, sword and fist fights, and numerous duels as Robin Hood saved Lady Marian from the dastardly Sheriff of Nottingham. Hollywood-style props made the fights seem more realistic. 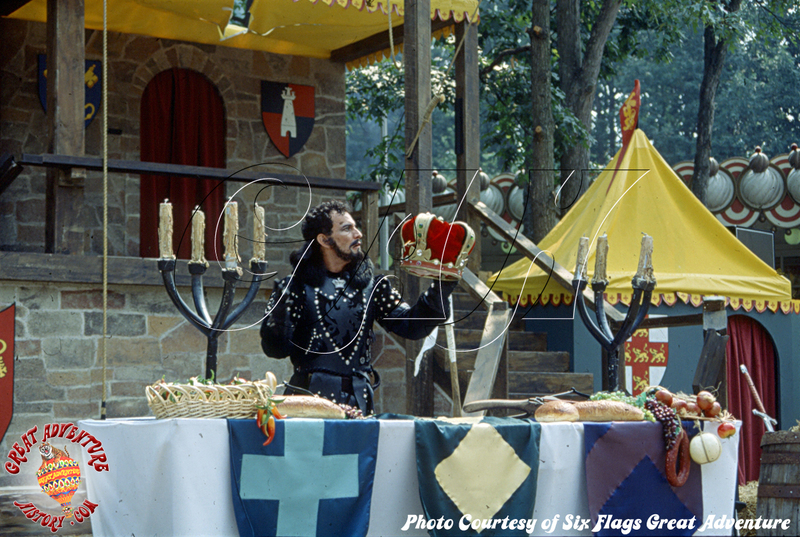 These included sword-split candelabras, breakaway chairs and railings, and a collapsible banquet table that looked like it had been set for a King. 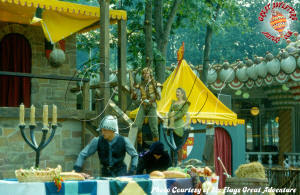 The fast paced action sprinkled with often corny humor made for an enjoyable show which played to wide eyed kids and cheering adults. 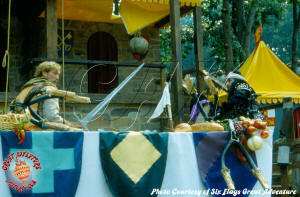 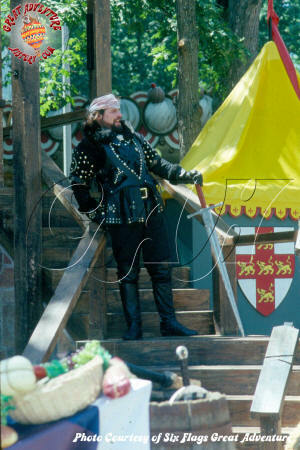 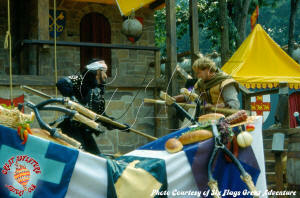 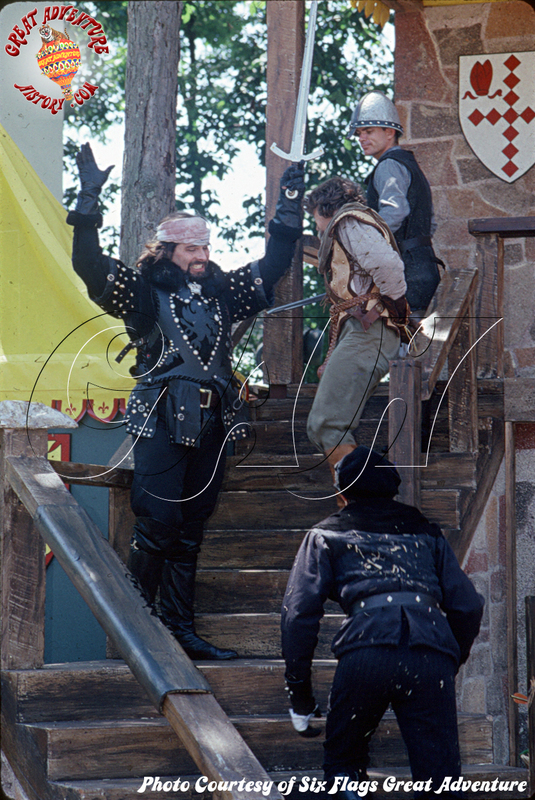 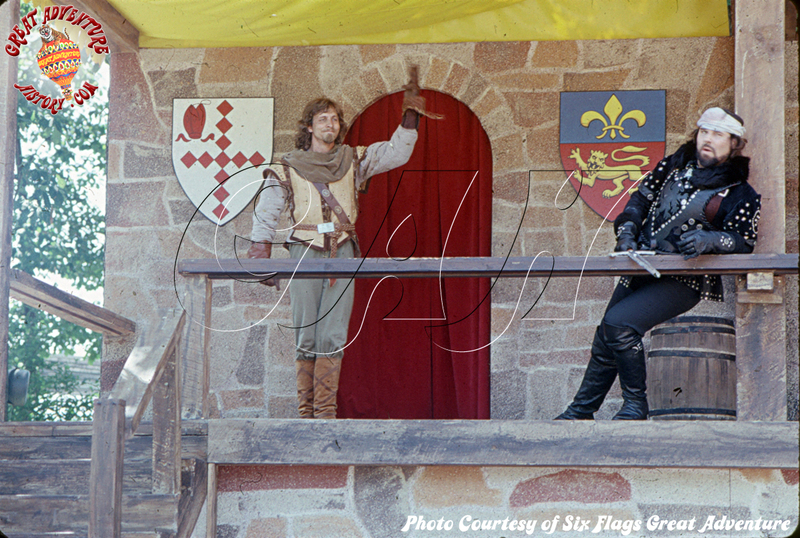 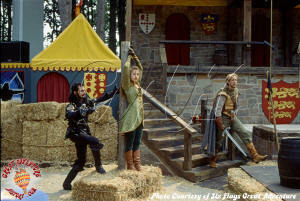 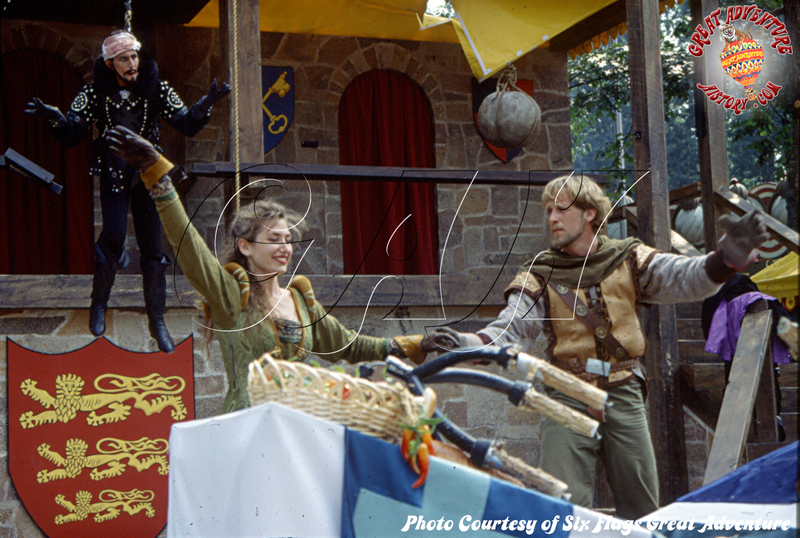 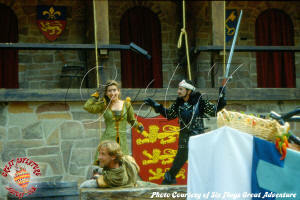 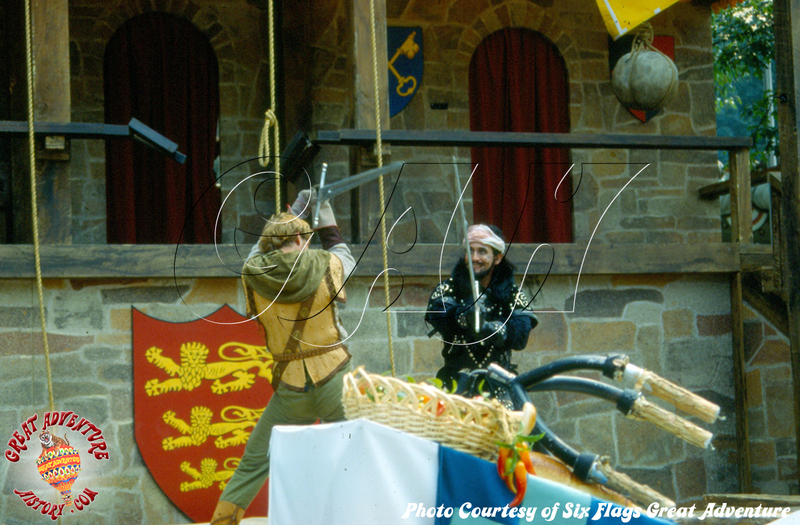 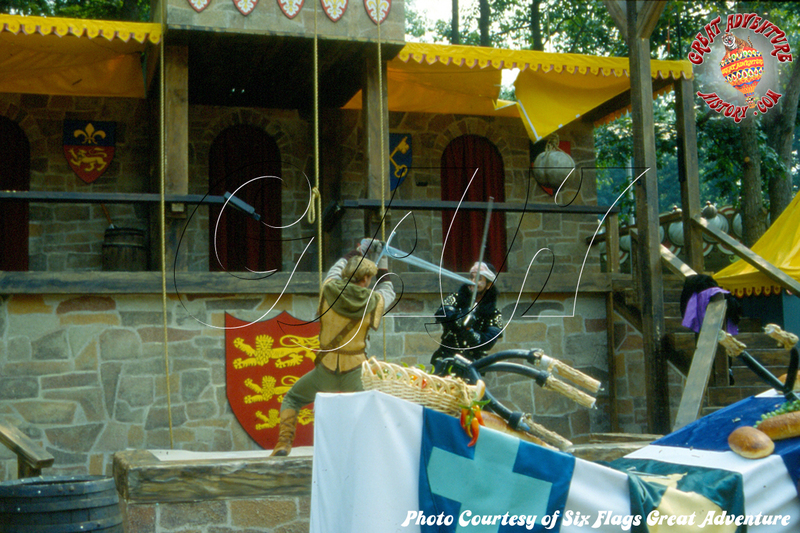 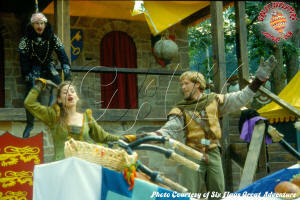 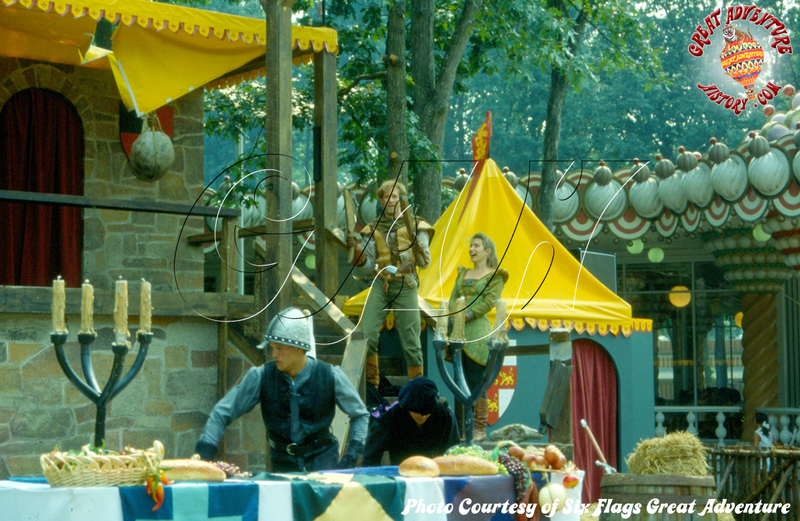 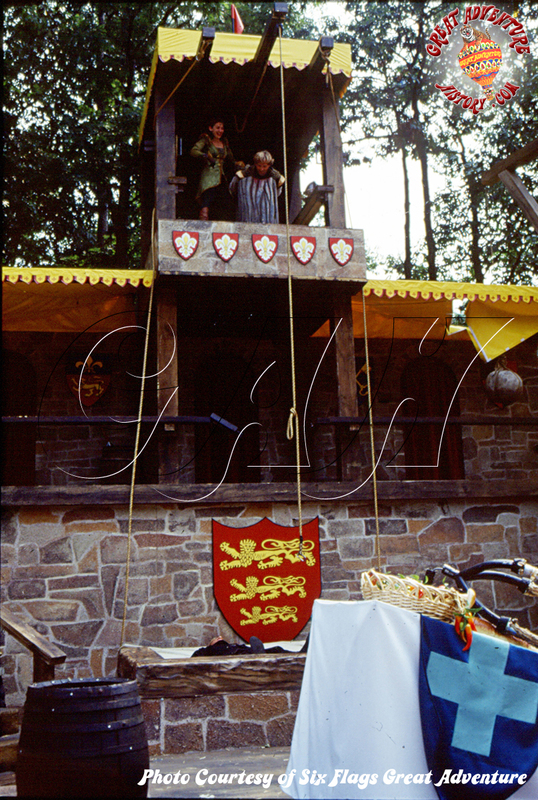 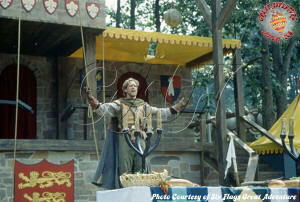 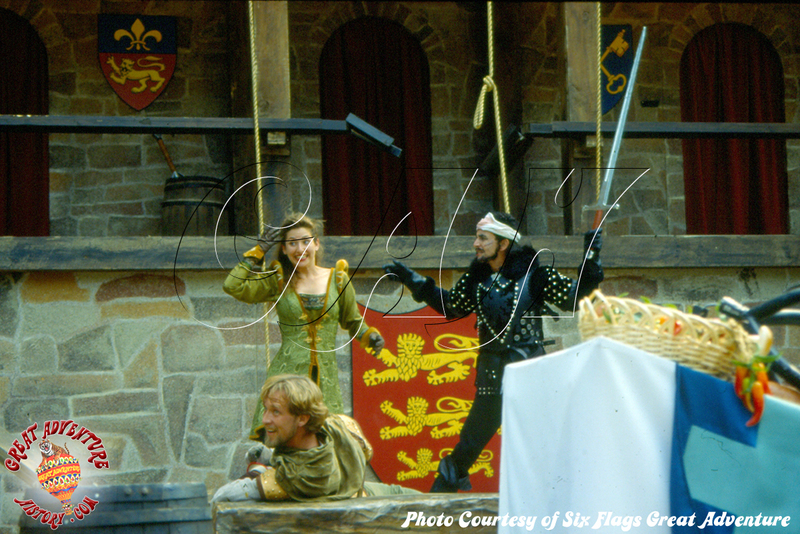 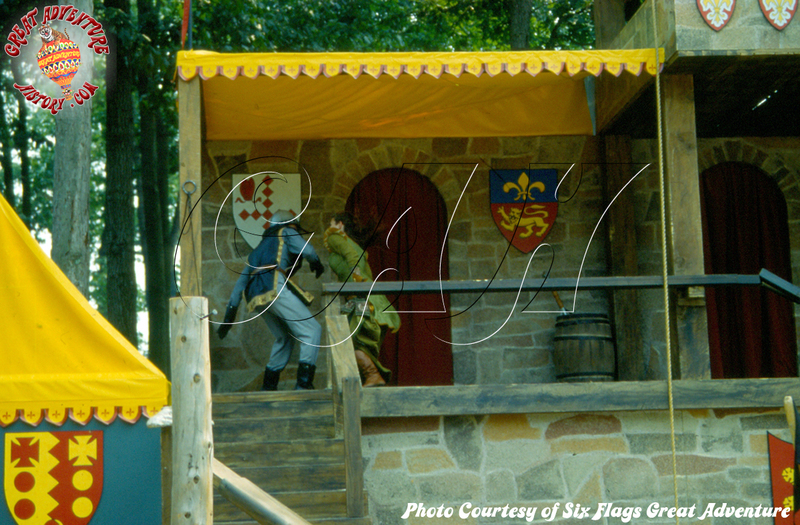 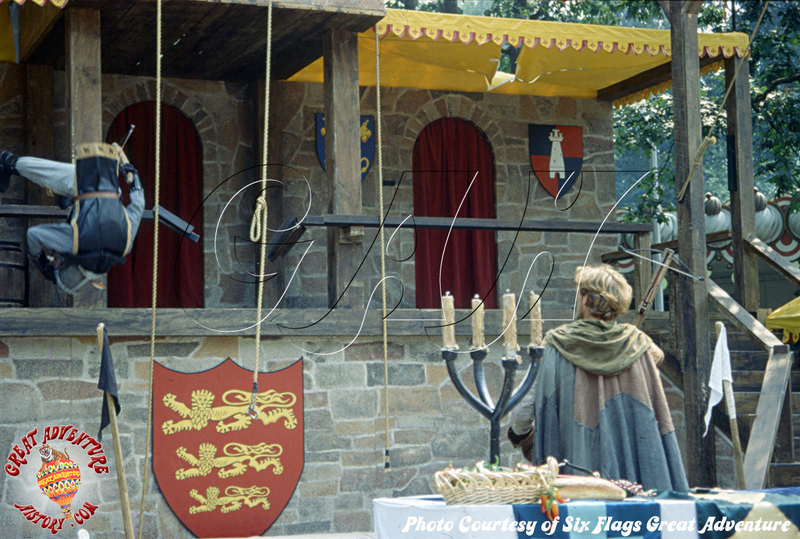 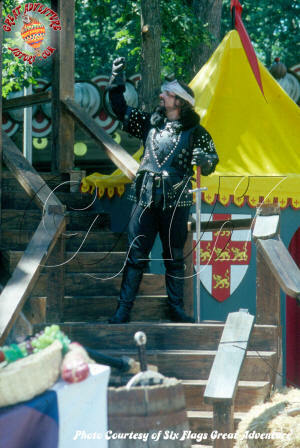 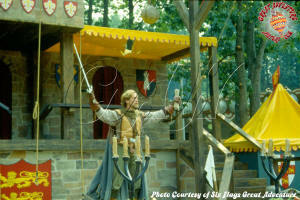 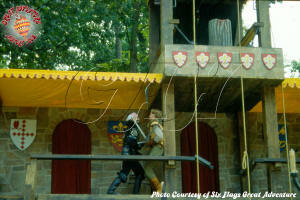 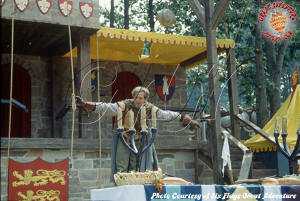 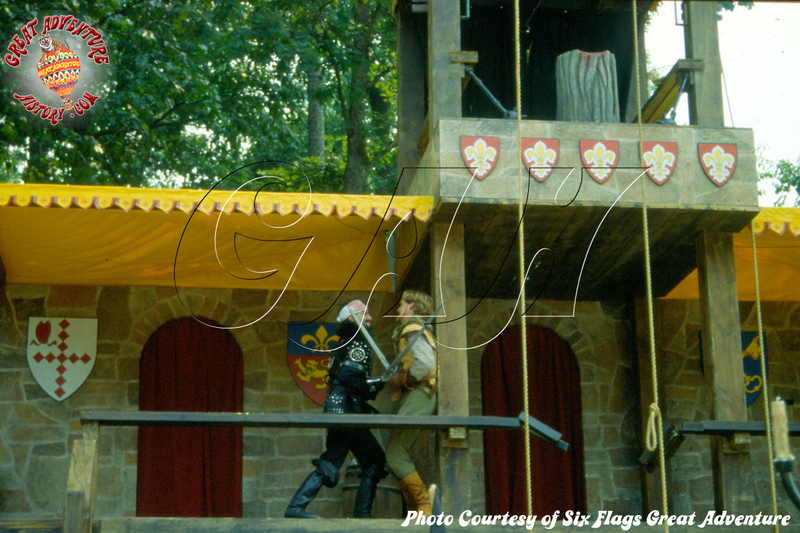 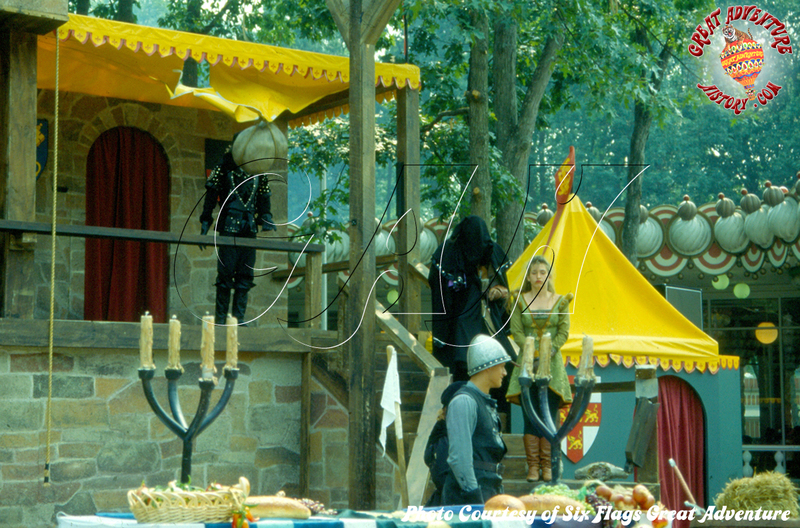 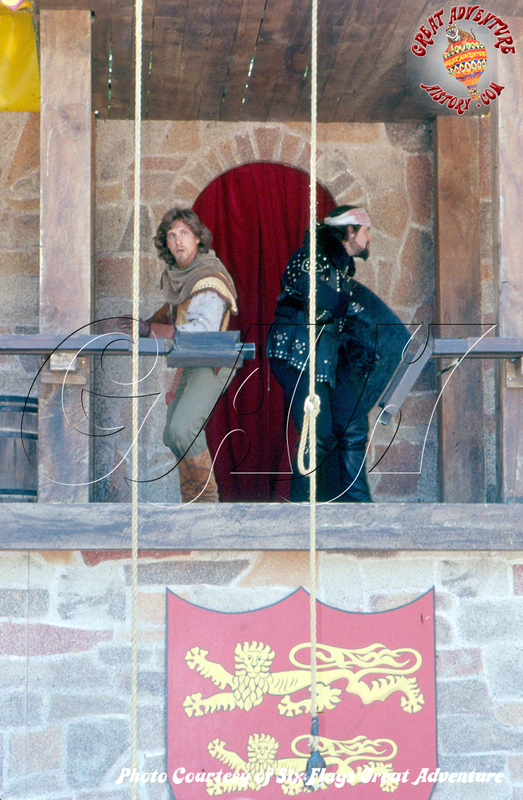 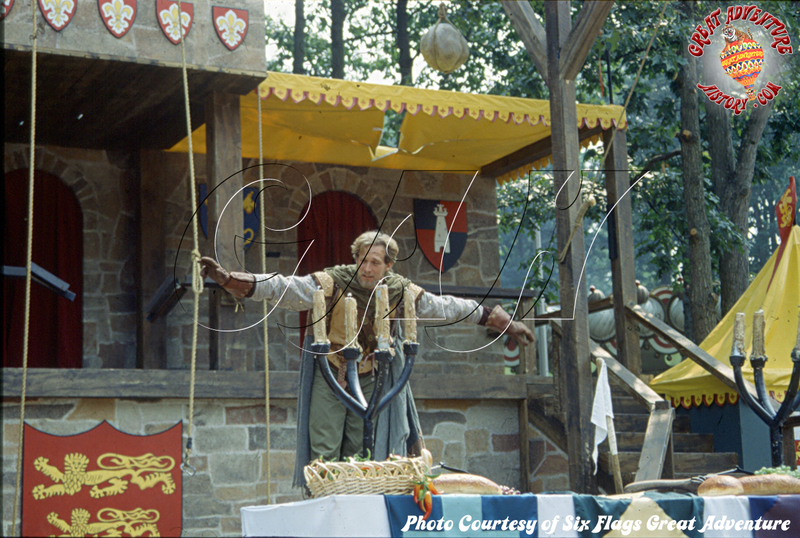 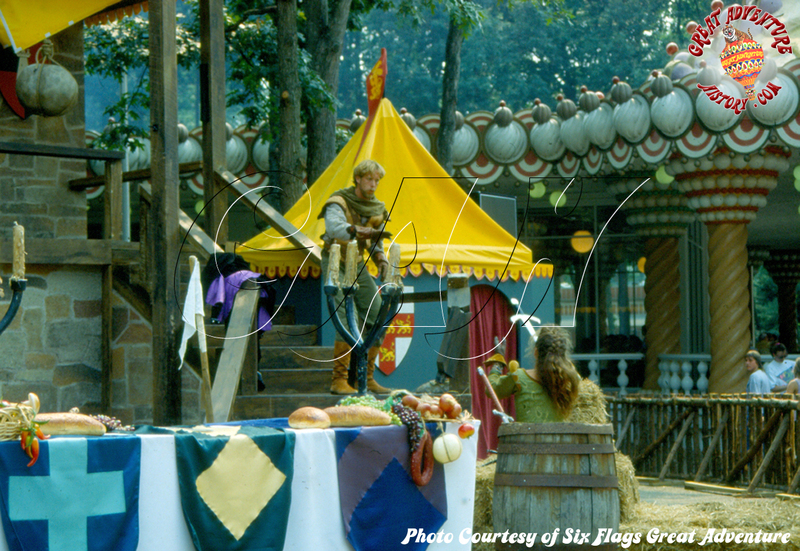 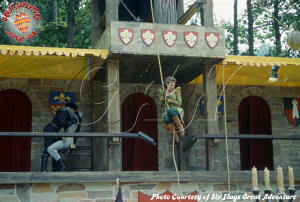 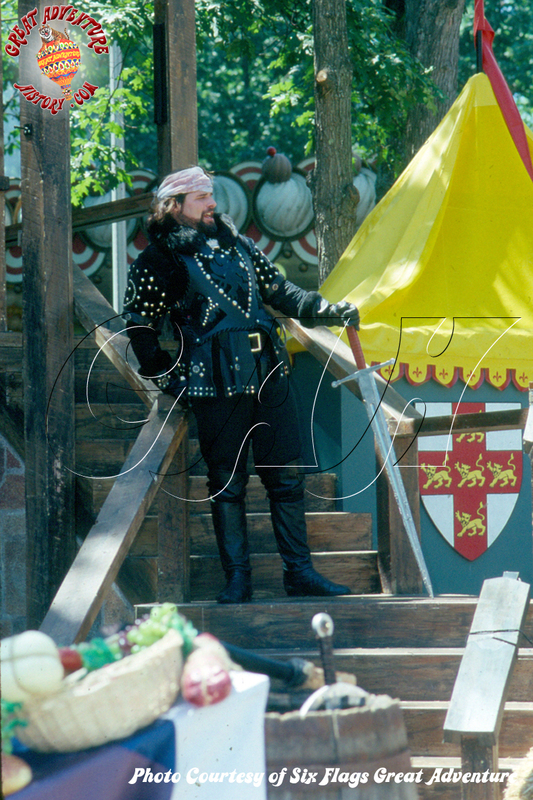 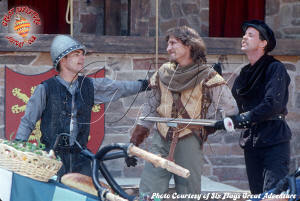 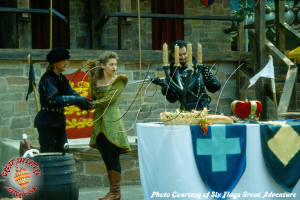 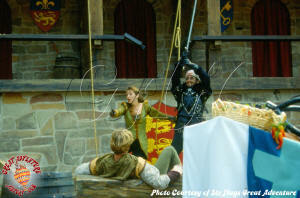 Great Adventure staged a stunt show and Robin Hood was an experiment to see how well this type of show would still play to a New Jersey audience. 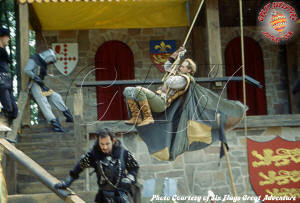 The test yielded high praise and gave the park the green light to proceed with an even grander show and venue in 1992, the Batman Stunt Spectacular. Several years later the action would continue with the addition of the Lethal Weapon Stunt Show at the Great Lake Grandstands. 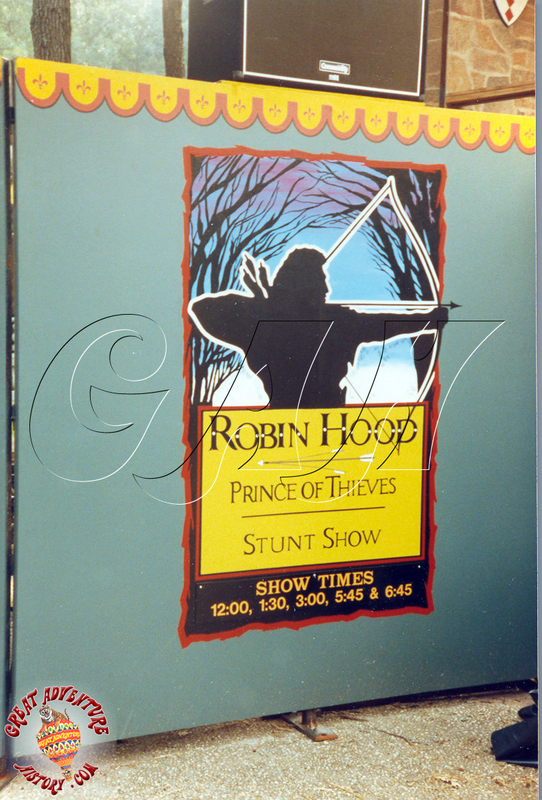 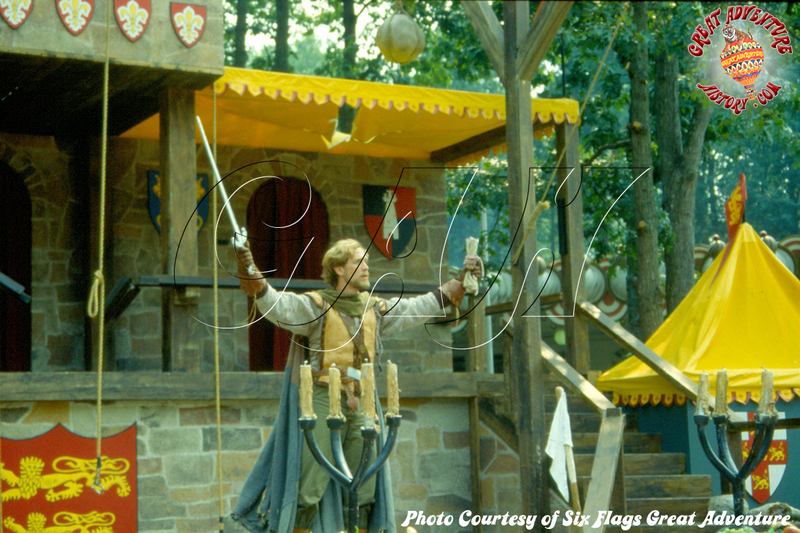 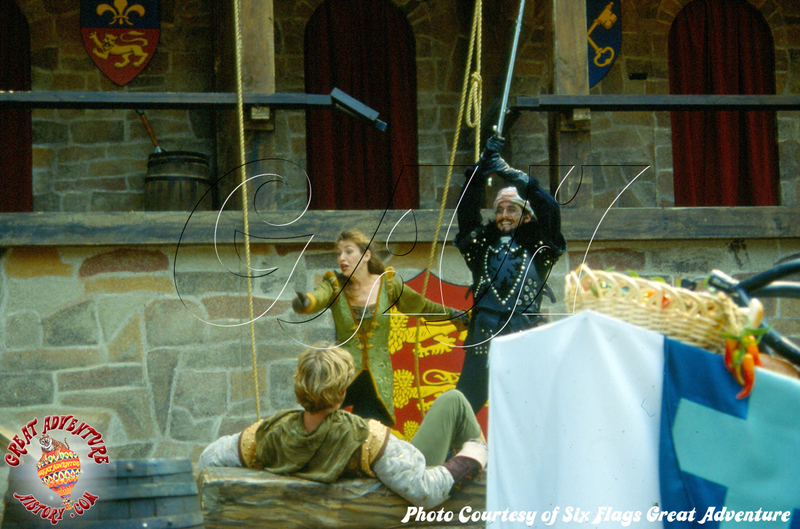 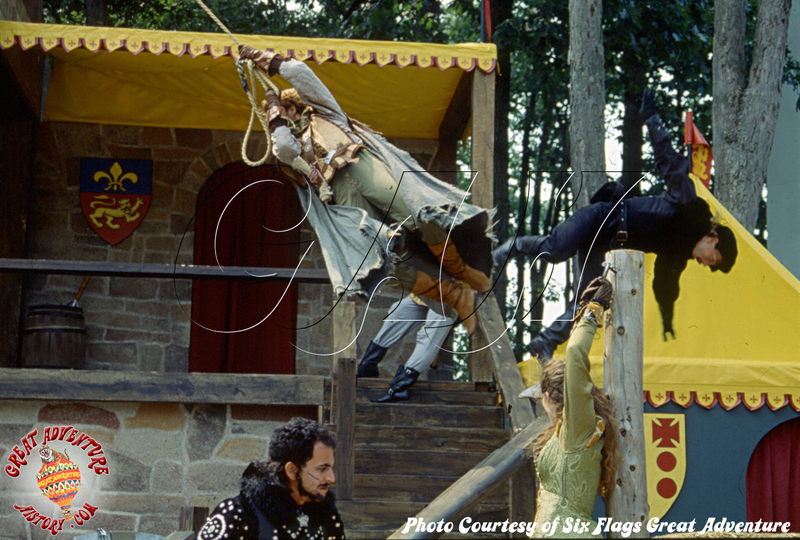 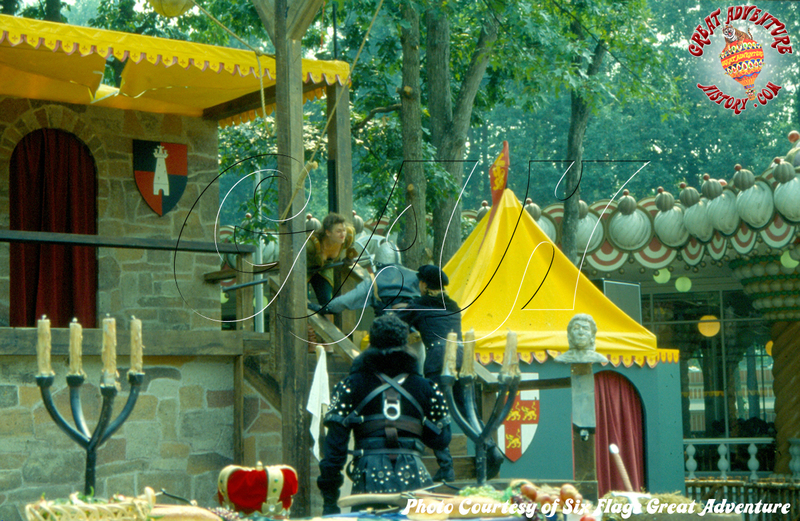 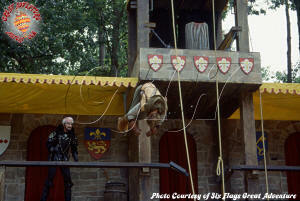 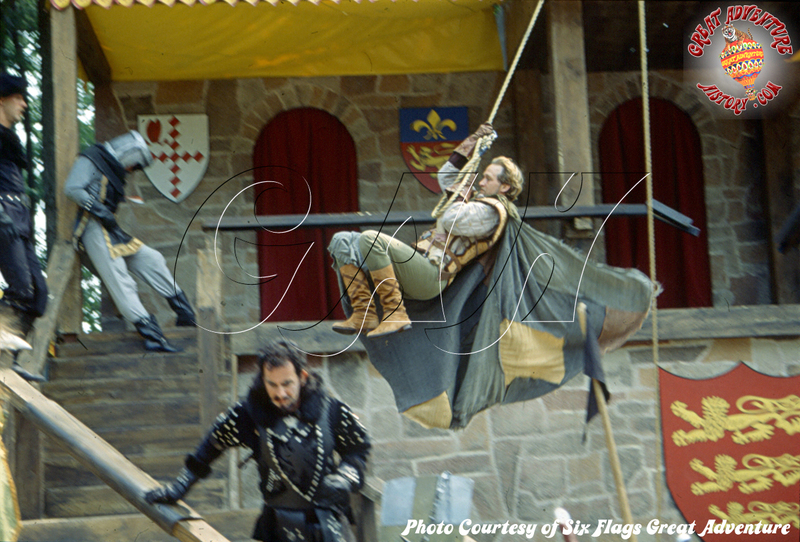 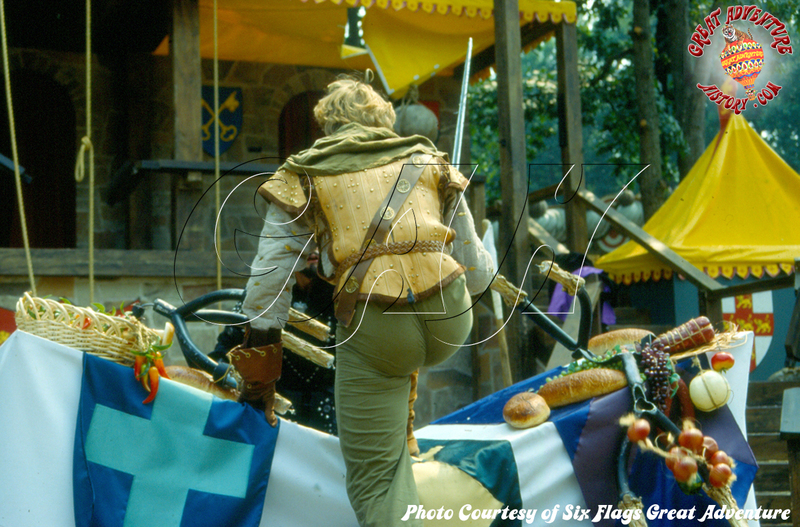 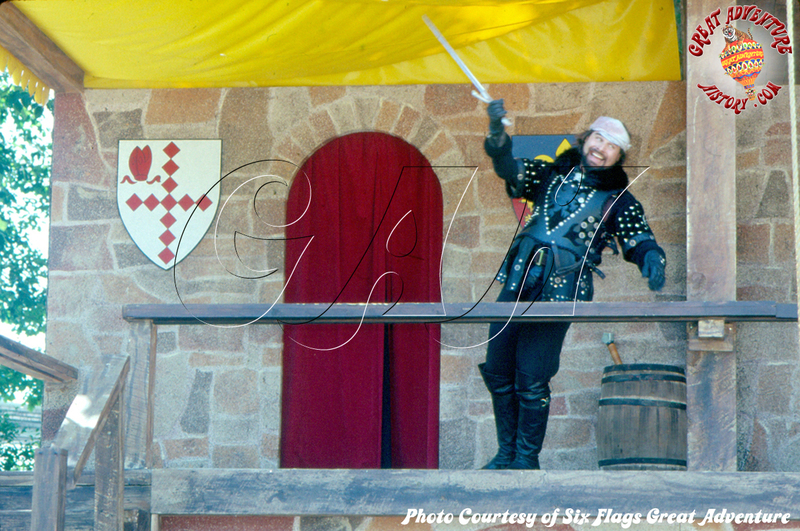 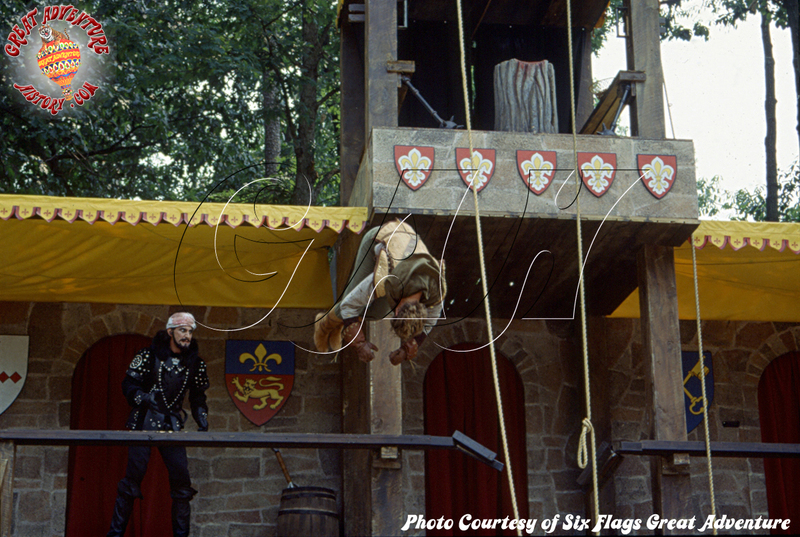 All of Great Adventure's high budget stunt productions started with that little seven week experiment, the Robin Hood Prince of Thieves Stunt Show. 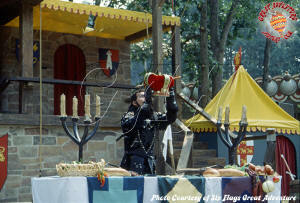 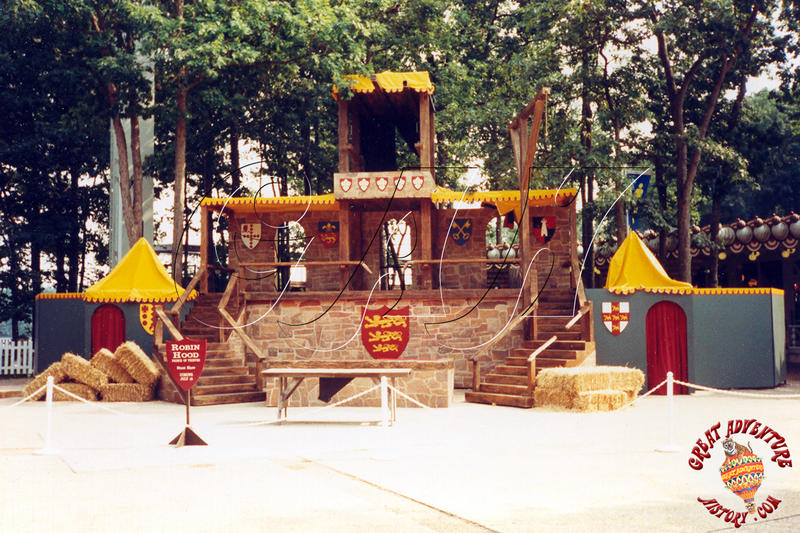 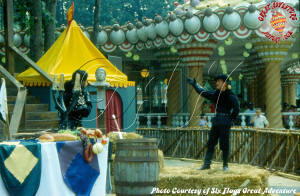 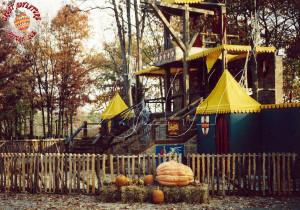 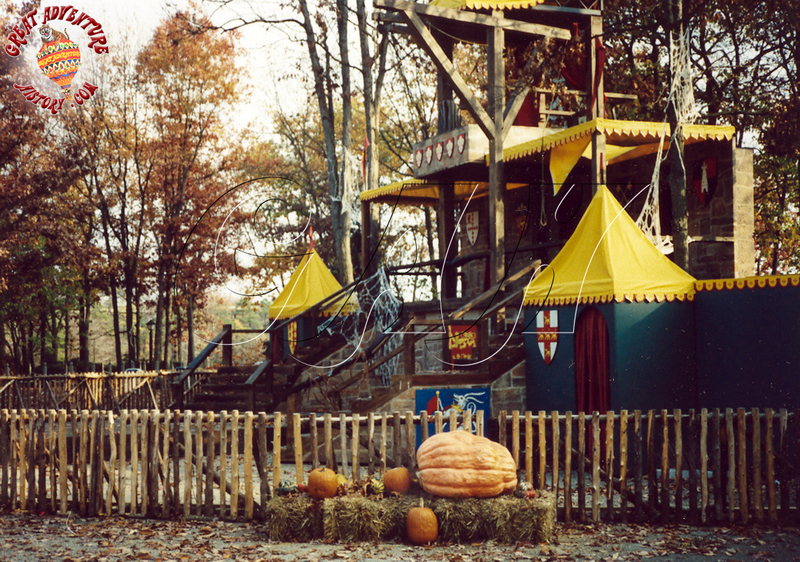 After the last Robin Hood performance on September 2, 1991 the stage became home to a magic competition during Halloweekends known as Battle of the Sorcerers. 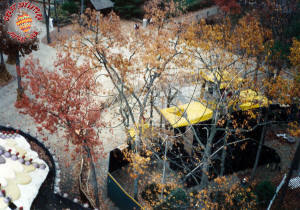 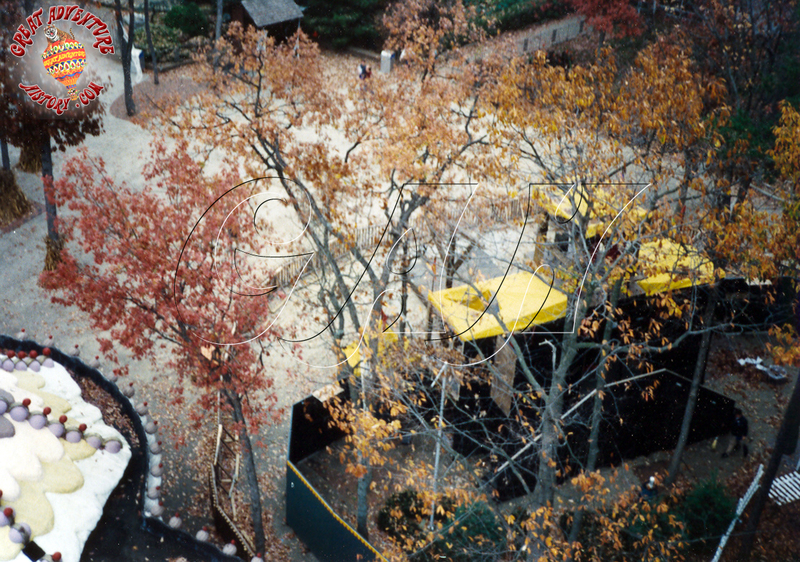 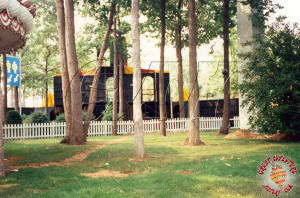 The stage was removed after the park closed for the season. 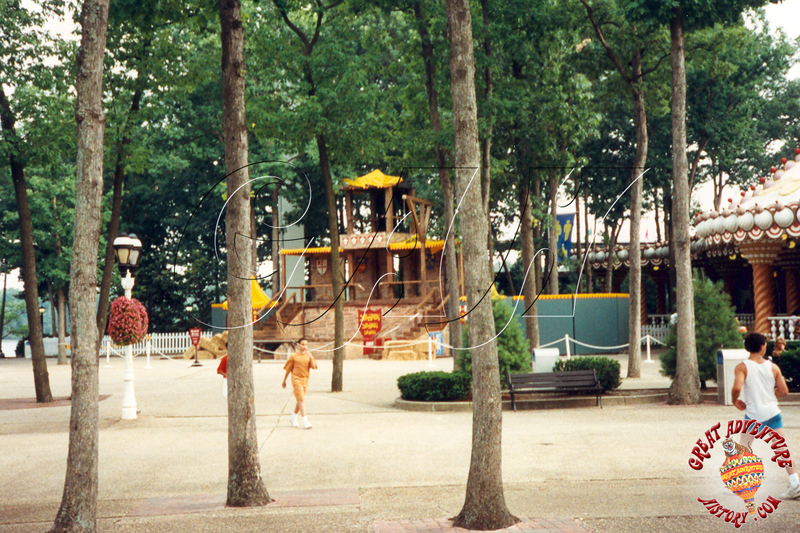 The area remained vacant until the installation of the Enchanted Teacups in 1994.